Only a few, ok, a couple more hours until we are officially on my favourite day of the year: Halloween. I have never been quite sure what it is about this particular day, but it is just magical to me. I mean, I could happily do Halloween-y things all day, errrrrday, but.. ehh.. why not have one day to glorify them? I am getting off topic. Before I do the.. uhhh.. gross nails I want to sport for Halloween, I figured why not sport cheeky and fun nails? So, I did. Cuteness overload. Well, as cute as spiders (crabs?) can be! I did this mani based off of THIS photo.. and hers are extremely cute.. and more spidery.. Some of mine are pretty derpy, buuut.. I surprisingly got a wealth of compliments on these. Hey, I will take it! 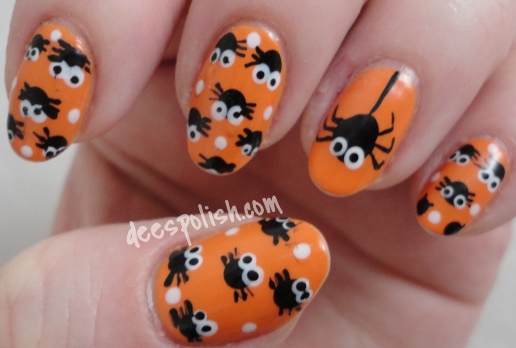 That is all for today.. see you again in a few hours - I will be sharing my Halloween nails for 2014!